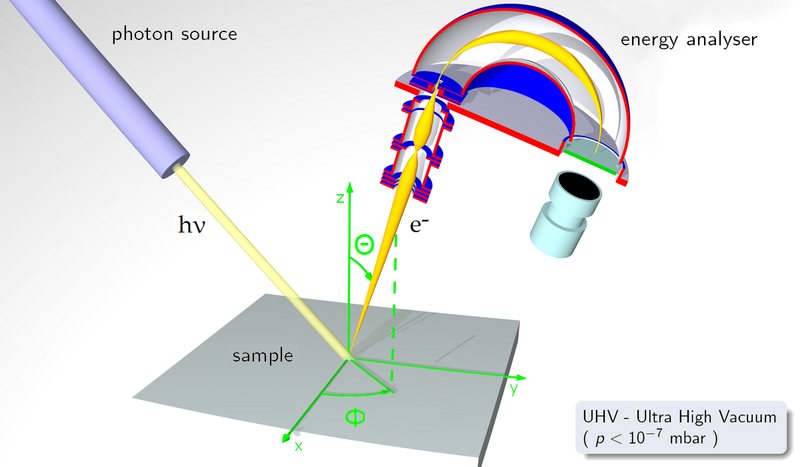 ARPES (Angle Resolved PhotoElectron Spectroscopy) makes use of the photoelectric effect discovered by Heinrich Hertz in 1887 to study the electronic structure of solids. The photoelectric effect is demonstrated when light above a certain frequency shines on a surface causing some electrons near the surface to be ejected when they absorb energy from the incident photons. In our ARPES experiments, we typically use a noble gas discharge lamp or synchrotron radiation as the light source. An electron analyzer then collects some of the ejected electrons for analysis. Typical analyzers in use today measure the number of electrons as a function of the emission angle (or equivalently, the momentum) and the kinetic energy of outgoing photoelectrons. By making use of the laws of conservation of energy and momentum, we can calculate what the momentum and binding energy values were when the electron was in the sample. For the momentum, we usually can only determine the momentum of the electrons inside the solid along directions parallel to the sample surface. This is because that, while the momentum is conserved along the parallel directions, it is not conserved in the normal direction due to the symmetry breaking on the surface. Superconductivity is a phenomenon observed in some materials wherein the resistivity of the material quickly drops to zero below a certain critical temperature Tc that is unique to the specific material. Below this Tc the substance conducts electricity without resistance, meaning that no energy is lost as the current travels through the material. Such a current, once set up, can flow forever. 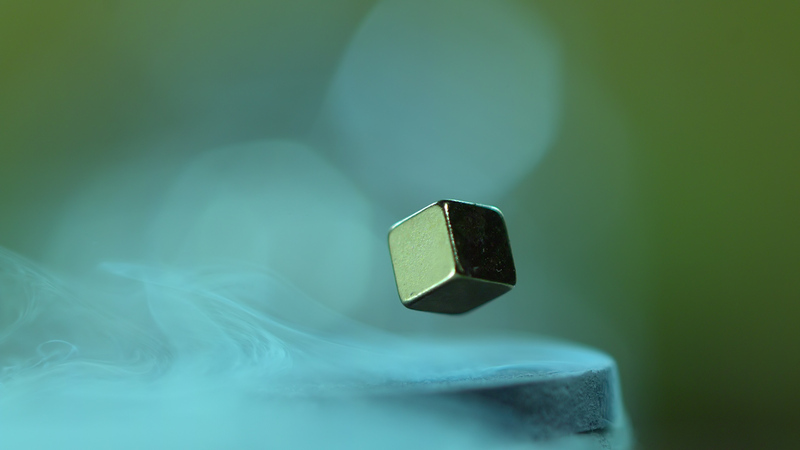 Another interesting quality of superconductors is called the Meissner effect. In a superconductor, the magnetic field will be expelled out from the bulk of a superconducting region. The focus of our current research is high-Tc superconductors (HTSCs), including the copper oxide superconductors (cuprates) and the newly discovered iron arsenic superconductors (pnictides). We are currently conducting several ARPES projects to determine the electronic structure of these novel superconductors. The first known conventional low-Tc superconductor, mercury, was discovered at the beginning of twentieth century. Most LTSCs are single elements or binary alloys. Their critical temperatures are low, normally around the temperature of liquid helium, 4 K. Some binary alloys have Tc up to 23K. The BCS theory was developed by Bardeen, Cooper, and Schrieffer in the 1950's to explain the mechanism of conventional superconductivity. Thus, the conventional LTSCs are also called the BCS superconductors. The central concept of the BCS theory is the Cooper pairing in which two electrons form a pair by an effective attractive force. Unlike individual electrons, which have to stack up in energy levels, Cooper pairs, as a Boson, can all condense to the lowest energy level, creating an energy gap at the top energy level (or Fermi energy). This superconducting gap protects the superconducting state from small perturbations, and therefore electric current can be carried by Cooper pairs without resistance. The Cooper pairs in the conventional LTSCs are mediated by phonons, which are vibrations of the crystal lattice. Each Cooper pair forms a spin singlet state (S=0) and carries charge 2e. The energy gap (order parameter) is isotropic (s-wave) in conventional superconductors. In 1986 Georg Bednorz and Alex Müller discovered a new superconducting material, La2-xBaxCuO4, with a Tc of 30 K. This discovery quickly led to discoveries of more copper oxides with higher transition temperatures. The crystal structure of HTSCs are quite complicated . Most of their structure is composed of layered copper oxide planes. The picture below shows the unit cell of Bi2Sr2CaCu2O8 (Bi2212). The electron conduction essentially takes place within the quasi two-dimensional CuO2 planes. In Bi2212, two CuO2 are separated by Ca plane. BiO2 layers are interlayer regions which serve as charge reservoirs. The chemical bonding between BiO2 layers is a weak Van Der Vaals bonding. When a sample is cleaved, this layer usually separates relatively cleanly, leaving a flat, clean surface for ARPES study. HTSCs have some properties similar to BCS superconductors. Experiments showing that the carrier charge in high Tc superconductors is 2e indicate that electron pairing still occurs, and the Cooper pairs are in the spin singlet state, or S=0. However, there are many differences between HTSCs and BCS superconductors. For example, unlike BCS superconductors which have an isotropic (s-wave) order parameter, HTSCs have a highly anisotropic (d-wave) order parameter. In addition, HTSCs have a weak isotope effect, suggesting a non-phonon mediated pairing mechanism. With these and other differences, it is now accepted that HTSCs can not be described by BCS theory. The normal state properties of HTSCs are also quite anomalous. Electronic transport properties are anisotropic. Resistivity along the direction perpendicular to the CuO2 planes is a hundred times larger than that parallel to the CuO2 planes. Even the in-plane transport is not Fermi liquid like, which can describe the normal state of BCS superconductors. The in-plane resistivity has a linear temperature (T) dependence while BCS superconductors typically have a T2 dependence. 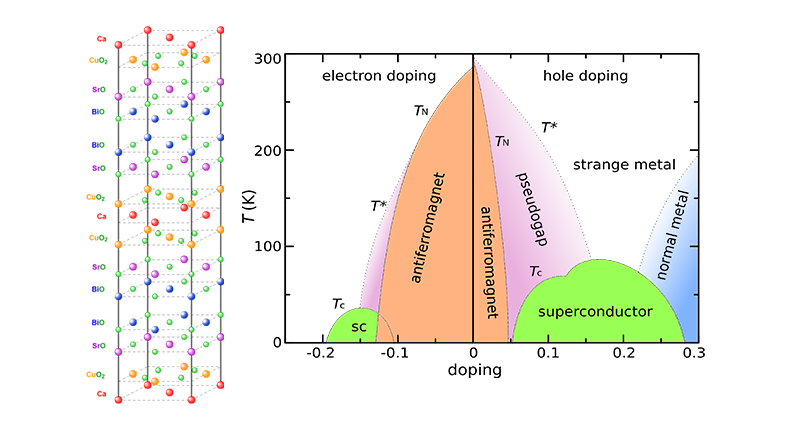 The picture above shows a universal phase diagram of HSTCs. The parent compounds of HTSCs are Mott insulators with an antiferromagnetic ground state. With the increase of hole doping, the materials turn into superconductors. This implies that correlations and magnetism in HTSCs are important. Different competing phase may interplay with the superconducting region. All of these make the HTSCs problem difficult to solve.